This morning I realized that there are things I know that I would NEVER have known about without the Internet or social media. It's everything from the sublime to the ridiculous. From designer lipstick dupes to historical facts, from the best way to eat a pomegranate to cutting edge science. Every now and then there are small, unexpected, enriching pieces of information that come my way via the World Wide Web. One such is the Haka. The haka is a type of ancient Māori war dance traditionally used on the battlefield, as well as when groups came together in peace. 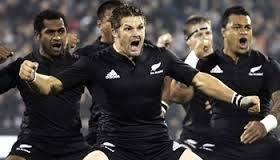 Haka are a fierce display of a tribe's pride, strength and unity. And they are an amazing sight. It's a New Zealand thing. And New Zealand is a small, very remote country. It is so far from where I live, that though I have dreamed of visiting - it may never happen. Here are three epic videos, each garnering millions of views that vividly portray the Haka.